Plutarch writes for Parthenon's manufacture speed (Pericles, 12): "For this, Pericle's work is being admired even more, because in a so little time it became such so, to live for a long time. With regard to their beauty, each one them was from the beginning ancient styled , but continues even today to give the impression that is recent and new, this work has an eternal spirit , soul that does not age… What distinguishes Parthenon from all the other Greek monuments, is his original arrest, his studied harmony and the conscience of aim that had his authors. In Parthenon, on the contrary to what it happens with the Propylaia, the architectural part appears subjugated in a sculptural idea. Phidias, more from Ictinus, is the father of monument. The abundance of sculptural decoration, but also the decisive, organic place that had the chryselephantine statue of Athena inside , confirm about that. Essential is not the temple, but the statue. Containing could not be comprehended without the content. The sculptor and the architect studied together the drawing and they corrected each other many times, in order that the proportions of statue suit absolutely with dimensions of entire building. The goddess Athena should have been visibly from everywhere, she was the matron of the area, the protector of city. Only Phidias, author of Athena Polias and Athena Lemnia, was capable to create Athena of Parthenon. He had here a complete freedom of action, contrary to what had happened in Olympia, where the temple of Zeus had not made for Zeus statue that finally Phidias manufactured. They had not right those who say that Parthenon is the more clearly model of Dorian temple. Actually, combines the ionic proportions with the Dorian severity and this solution suits with the atticism role, which reconciles Greece of Asia with Greece of West. Eclecticism of Parthenon raises him above the togh rules of the sculpture schools and allows a superior composition. The chryselephantine idol of Virgin Athena developing the idea of an ultimate perfection, that her image could not be carried out but only with the concentration of the most precious and incorruptible materials. The statue of Athena was made more to frighten than to warm hearts of ordinary souls. It is characteristic that Athenians saw her collectively, in the large celebrations and not individually. Athena Polias, which found itself in Ekatompedos temple. The enormous statue showed the Goddess in all her gravity and rigidity, with all the armor (aegis, helmet, spear, shield) with her follower, the Snake, and her eternal companion, the Victory. From a copy survived (the marble Athena of Varvakeios from the roman era,) and we know that she stood upright she wear a golden peplos, touched with her left hand the shield and held the spear standing at her left shoulder. In her right hand kept a chryselepahntine Nike. The helmet was full of relief forms. The aegis was golden, with snakes and a representation of a head of a Gorgon. Her face was white youthful, peaceful, cool and beautiful. Her expression showed willingness and deep thinking, , but also virgin charm and modesty. Phidias had given for ever the ideal type of war-friendly but also peaceful Virgin, which symbolized the purity, the force and the intelligence. The statue of Athena stood on the cella of the temple, between a double row of Doric columns, which behind the statue were linking with a series of other cross-cutting columns in the shape of Π. When columns have teetered up to a certain level, they hold an epistyle and above existed other columns , Dorian and those, that reached up to the roof. With the help of this trick, the roof was supported without needed to use very tall columns, which would be necessarily thick and consuming large area. Cella had internal length of 100 Attic feet, it was "ekatompedos" also, and was separated from the rest of the temple with a transverse wall. Beyond from this wall existed the western department of the temple, which had not worship purpose, and four columns holding it's roof. There existed offerings to the goddess and were staying the virgin priestesses. By the name of this department (Parthenos - Virgin) was named the entire building. Around the central Structure, which was located on a stylobate divided into three levels, dimensions 69.51 x 30.87 metres, there was a colonnade with a total of 46 Doric columns, 8 in the close quarters and 17 on the long (the angle are counted twice ). 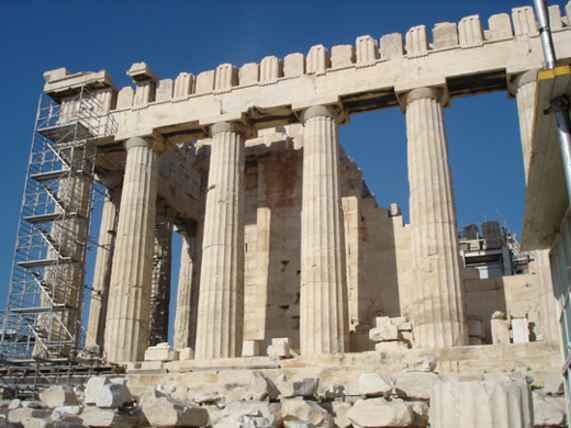 The lines of the Parthenon, either horizontal, as the lynchpin, the architrave, the frieze, or vertical, such as columns, they give the impression of the straight line, but there is no straight and no vertical line at all. The surface of pillar has a light elation in the long sides, in the middle, that reaches 8 cm and is lost smoothly in the 69,51 metres of total length. Proportional is also the curvature of the architraves. As for the columns, while they refine from the bottom up, they made a blister before the middle lean slightly inside, so if we extend them mentally upwards will form a pyramid. Instead, the roof with the cornices is flown somehow sideways to outside. This divergence from straight on gave in the building the appearance of live total, while the effervescent colours cut the monotony of white, and underlined the architectural members and their functional role. First that observed this technical finenesses, designed to correct the optical distortion, that reflects to a geometric structure of such a building from the lens of the eye, was an English architect Penrose, in his book "Principles of the Athenian architecture". Over the architrave, that supported the columns, there was the frieze which was separated in reliefs and metopes. Parthenon has 92 metopes with reliefs depicting goddess Athena in her various fights (War of giants - Gigantomachy) or encourages the heroes in the Troy-ian War in the wars against the Centaurs. From these metopes, which are works of many artists, 58 have survived, most in bad situation. Over the frieze is the cornice and the roof, where from the two narrow sides is leaving two pediments. In the eastern pediment is representing the birth of Athena, and in the western the fight of Athena and Poseidon for the possession of Athens. And the two sculptures are work of Phidias. In the four outer sides of the cella there is a frieze of marble, total length 160 metres, in which Phidias had depicted the great procession of the Panathenaia. This is a parade of 350 and most of humans and over 125 animals, which gives the impression that the entire city is heading toward the sanctuary, to offer the goddess the peplos which the Arrifores made. A big part of this sculptures and most of the statues of the pediment, the more well maintained metopes, one of the Caryatids of the Erechtheion, the statue of Bacchus, the sculpted pediment of the temple of Athena Nike and many other sculptures - a total of 253 - have been transported from the British diplomat Lord Elgin in the British Museum.